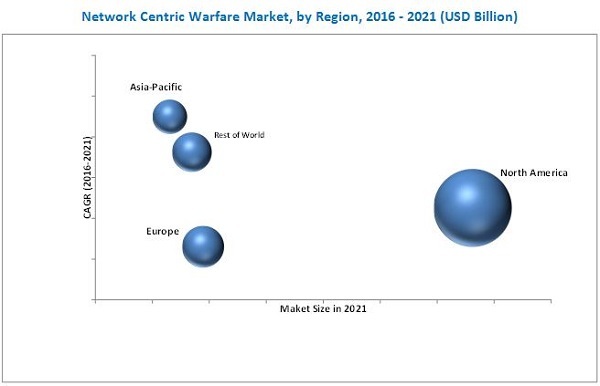 The network centric warfaremarket is estimated to be USD 46.23 Billion in 2016 and is projected to reach USD 57.68 Billion by 2021, at a CAGR of 4.52% during the forecast period. The report includes segmentation, analysis, and forecast of the network centric warfare market on the basis of platform, application, mission type, communication network, and architecture. It also involves analyzing new technological trends in the market and categorizes the market on the basis of region, such as North America, Europe, Asia-Pacific, and the Rest of the World (RoW), and drivers and restraints in the market. It provides detailed information of developments, contracts, and mergers and acquisitions by market players. The ecosystem of the network centric warfare market comprises defense establishments, defense communication industry, and network centric warfare radar manufacturers’ facilities, among others. Some of the key players in this market are The Raytheon Company (U.S.), Elbit Systems (Israel), and Harris Corporation (U.S.). “Study answers several questions for the stakeholders, primarily which market segments to focus in next two to five years for prioritizing the efforts and investments”. The network centric warfare (NCW) market is estimated to be USD 46.23 Billion in 2016 and is projected to reach USD 57.68 Billion by 2021, at a CAGR of 4.52% between 2016 and 2021. With increased demand for transformation of battlefield in the information age, growing need for networking unmanned platforms and huge investments for technological advancements in defense operations are driving the NCW market across the globe. In this report, the network centric warfare market has been categorized into six segments, namely, by platform, application, mission type, communication network, architecture, and region. The platform segment is divided into land-based, naval-based, airborne, and unmanned platforms. The land-based segment is expected to grow at the fastest rate due to procurement of land based network centric warfare solutions in large quantities in developing countries such as India and China. The mission type segment is segmented into tactical and strategic operations. The growing need for strategic operations in wartime for critical decision-making is expected to drive the network centric market during the forecast period. Communication network is segmented into wireless and wired network. The wireless segment is expected to grow at a faster rate due to its platform independent feature and cost efficiency. The architecture segment includes hardware and software. Rising need for middleware software in NCW systems is expected to drive the software market at a faster rate. On the basis of region, the market has been classified into North America, Europe, Asia-Pacific, and Rest of the World. Under the application segment covered in this report, the ISR (intelligence, surveillance and reconnaissance) subsegment is expected to dominate the network centric warfare market. This growth can be attributed to the rise in defense network centric solutions in emerging markets, such as India and China, where the demand is increasing due to regional disputes and border surveillance. North America is expected to lead the network centric warfare market in 2016, followed by Europe. The market in Asia-Pacific is projected to grow at the highest CAGR during the forecast period. Factors driving the growth of this market include rising demand for technologically advanced defense equipment in the information age and increase in networked UAVs used by developing countries for border surveillance. On the other hand, recent changes in defense budgets of developing nations for technologically advanced marine, land, and air defense equipment are expected to positively affect the market in the region. Factors such as defense budget cuts by American and European countries and inability of network centric warfare systems to self-heal in case the communication nodes are interrupted, are expected to restrain the growth of this market. Key players operating in the network centric warfare market are Lockheed Martin (U.S.), Northrop Grumann Corporation (U.S.), The Raytheon Company (U.S.), BAE Systems Plc. (U.K.), and Elbit Systems Ltd (Israel). Contracts, partnership and agreements are the major growth strategies adopted by the players to strengthen their position and enhance their product offerings in the market. 14.11 L-3 Communications Holdings, Inc.